One of the interesting things I find with regard to my history of food is learning that there exists a great dichotomy in terms of how I view food my family would make. There are certain dishes for which no other will compare. It doesn't matter who makes it or how much better it should be, it will never compare to my Mom or Dad's home cooked version. Then again, there are some things for which, to this day, I am confused that we ever ate in such a state. Burgers is one of the latter. It was difficult for her in other respects as well. My father tended to have very simple tastes, and while he did appreciate spicy food, he never was overly keen on flavorful food. My mom, on the other hand, grew up with a budding home chef for a father and he tended to make all sorts of amazing food with very simple and cost effective ingredients. As such, my mom always felt like she was holding back when cooking for the family. Burgers in our family generally were very simple. Form the patties with ground beef. Throw them on the grille. Top them with cheese as desired, and eat. Most often, we ate them in fresh homemade tortillas instead of buns, and my father would top his with fresh roasted New Mexico green chile. And even with such simple burgers, there is something to be said for a good tort-burger. It wasn't until I was at a barbecue at a grade school friend's home that I realized that burgers could actually have flavor and that I might actually have a choice in how done they could be. That experience changed my whole view of a burger. These days, I generally still keep it simple. I've come to appreciate enjoying the burger itself without all the need for extras. Thats not to say I don't enjoy a few extras now and then, but really, if they take away too much from the flavor of the meat, I don't go there. I generally take about a pound or pound and a quarter of middle of the road fat content ground beef. Too fatty, and most of your patty ends up leaching out. Too little, and you lose not only flavor, but your patties won't stay together very well without filler. To that, I mix a good sprinkle of garlic powder (maybe a teaspoon), a good shake of Montreal Steak Seasoning (minced garlic, salt, black pepper, and a little bit of cayenne), and a light dusting of dried dill (1/8 teaspoon). I mix that in thoroughly and form patties. Works out to be about 3 large patties or four modest ones. You can of course up your meat and seasonings to accomodate however many you'd like. Cook them on the grill until they are just on the edge of done and top them with a thick slice of sharp cheddar or some other interesting cheese. Toss it on a bun, and thats about as simple as it gets. 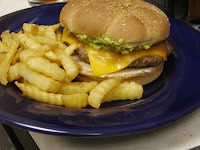 Alternately, I often also like to top it with pepperjack, and then whip up some homemade guacamole to spread on the bun. And I too have been known to take the same burger, cheese it as desired, slice it in half, top it with fresh roasted green chile, and roll it in a fresh flour tortilla. Simple, but delicious. And a long way from the cheese-covered hockey pucks I grew up with. Hand me my tongs, Q! Who's alfredo of the big bad pesto?